Journalists were the targets of anti-press sentiment and actions from officials, security forces and citizens leading up to and during the Oct. 15 regional elections for 23 governorships in Venezuela. Even in the months leading up to the elections, Correa said, there was a restrictive policy that resulted in the reduction of pluralism, with the closure of more than 50 broadcast stations, police detention and violence in cases of open censorship against national and international media who were carrying out their work. Ahead of the elections, La Patilla and other media reported that the National Electoral Council (CNE for its acronym in Spanish) denied credentials to journalists from various media outlets across the country to cover regional elections on Oct. 15. Journalist Eugenio Martínez of the newspaper El Carabobeño de Táchira, who according to La Patilla has covered 18 previous elections, was among those reporters who did not receive accreditation from the CNE. Come election day, there were reports of reporting teams being denied access to polling centers, as well as journalists being kicked, beaten, threatened and robbed. 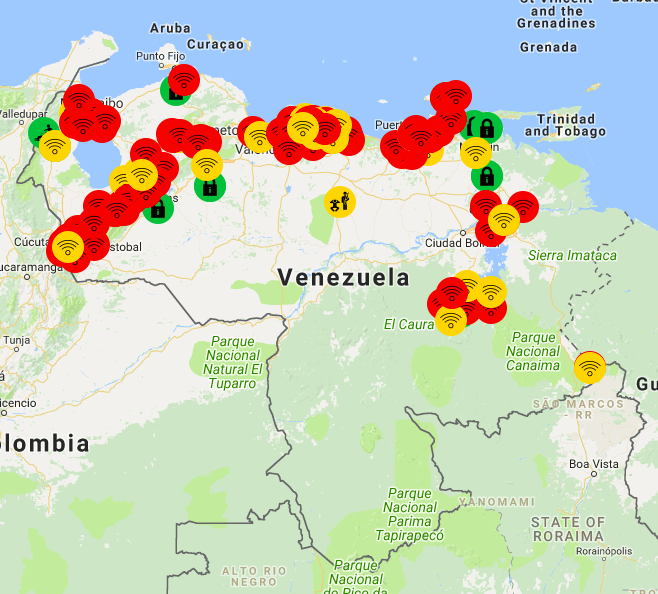 Using the help of citizens and its network of correspondents distributed among 19 Venezuelan states, the Press and Society Institute of Venezuela (IPYS Venezuela) recorded press freedom and internet access violations in real time during the elections. Verified incidents were published via Google Maps throughout the day, according to the organization. Organizations like the National Association of Journalists (CNP) and the National Association of Press Workers of Venezuela (SNTP) also spent the day recording attacks via their Twitter accounts. "We denounce all the impediments of coverage, aggression and threats to our journalists and the media they represent," the National Association of Journalists (CNP) in Venezuela said via Twitter. In the western Venezuelan state of Táchira, VPItv and El Pitazo journalist Lorena Bornacelly and cameraman Óscar Duque were robbed of their work equipment and belongings from their car, which was parked near a polling station where they were working. In Valle de la Pascua in the state of Guárico in north central Venezuela, a soldier of Plan República –part of the armed forces responsible for security during elections – attacked journalist and director of site Notipascua, Franklin Carrillo, according to SNTP. He was also prohibited from exercising his constitutional right to because he was a journalist, Notipascua reported. "When I got to the (voting) room, a man who identified himself as the head of Plan República at that polling station asked me if I was a journalist. The moment I said yes, he told me that I should leave and that I could not vote," Carrillo told Notipascua. In response to his complaint, the Plan República agent broke the press card that Carrillo had hung on his chest, and later pointed at him with his gun, according to the journalist. On Oct. 16, the day following the regional elections, protesters in the town of Bolívar in the southeastern state of the same name attacked VPItv journalist Carlos Suniaga. "Carlos Suniaga was threatened and beaten by opposition supporters around the Regional Electoral Office, additionally, they forced him to erase the material from the protest and kicked him in the back," denounced the National Union of Press Workers of Venezuela (SNTP) on its Twitter account. Through Twitter, Suniaga said that both the opposition and supporters of the government must respect the work of the press. “We are not the enemy,” he added. In the northern state of Aragua, in the city of Maracay, where Vice President Tareck El Aissami cast his ballot, accredited reporters were restricted from covering the voting, according to El Pitazo. They were able to cover and broadcast live the voting of official leaders, but not the voting of the opposition, according to the media outlet. "The poor conditions of equality of opportunity for the dissemination of the electoral campaigns of the opposition candidates, the use of the totally biased public media towards governmental messages, the navigability in the Internet and disinformation affected the right of the citizens to to know the public interest issues related to the electoral process to elect the governors," IPYS Venezuela Executive Director Marianela Balbi told the Knight Center. For Balbi, the media ecosystem in Venezuela has changed due to censorship, official pressures and economic conditions, so digital platforms have become "essential windows to understanding the reality of the country," but the internet infrastructure at the national level has shortcomings. An example of this, said Balbi, is that Venezuelans navigated the Internet with a low speed, on average 1.38 Mbps, at the same time that CNE president, Tibisay Lucena, announced the triumph of the official majority in the regional elections. According to Balbi, the Economic Commission for Latin America and the Caribbean (ECLAC), in its 2016 report on broadband in Latin America and the Caribbean, established that the average speed in the Latin American region was 4.7 Mbps, with Chile being the country with the highest speed (7.3 Mbps) and Venezuela the lowest speed (1.9 Mbps). César Batiz, director of El Pitazo, told the Knight Center that telecommunications operators such as ABA of the Compañía Anónima Nacional Teléfonos de Venezuela (Cantv) and Digitel are blocking access to his media outlet, so they are contemplating a change of the DNS (Domain Name System). "One of the events that is repeated frequently during the campaigns is the indiscriminate use of State media outlets to promote only the candidacies of the ruling party. In addition, there is self-censorship in traditional media (TV, radio and press) to disseminate information about opposition candidates," Batiz said. Eighteen new governors aligned with the official party were sworn-in on Oct. 17, but the five opposition candidate who won boycotted the ceremony before the controversial constitutional assembly, according to the Associated Press. The outcome of the election was a surprise for the opposition, some of whom are alleging voter suppression at the hands of the National Electoral Council (CNE).